Paper Directory. 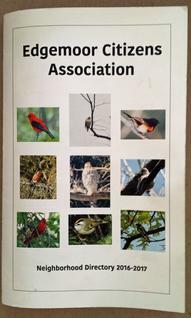 The paper Directory is a booklet, which is updated, printed, and mailed to each ECA member household (one per household) every year in the spring. Directory Phone App. There is a Directory phone app for both iOS and Android phones. Download the “HOA App” from AtoZ Directories from the iOS App Store or the “Neighborhood Directory App” from AtoZ Directories from the Android App Store. To use the phone apps, you need a username and password. See the discussion of usernames and passwords in "Using the Online Directory," below. Online Directory. The web-based online Directory is the repository for all of the information in the Directory, and both the paper Directory and the phone app. use that information. Therefore, the online Directory is the place to go in order to change any of your own household's Directory information. (For households that are not ECA members, we include information in the Directory that we draw from other available public sources.) See "Using the Online Directory" and "Updating Your Household Directory Information," below. The ECA uses a company called AtoZ Directories to produce the Neighborhood Directory. AtoZ also provides the online Directory and phone apps. The company relies on advertising for revenue, so you will see ads with each version of the Directory. Although the ECA would prefer not to have advertising with the Directory, doing it this was allows us to manage the process much more easily and to reduce costs so that we can devote most of our resources to neighborhood projects and events. If you would like to advertise in the ECA Directory, click here for the advertising agreement. In order to use the Online Directory, you need a username and password. Every ECA member has a Directory username and password, which were sent to ECA members when the online Directory was started several years ago. Since then, new ECA members have been given a username and password after they join. If you don't know your username or password, follow the instructions below for retrieving them. If you have any trouble, click on the "Need Help?" button on the lower left corner of the page. If all else fails, email ECA@edgemoorcitizens.org for further help. Passwords. If you know your username but forgot your password, follow the instructions above to reset your password. In step 3, you can enter either your username or your email address. To look up information for other households, click the "My Directory" tab. That will take you to the main Directory Page. Search by Address: On the left side of the screen, you'll see a large search box with several fields, which you can use to search the directory by address. For example, if you wanted to the listing for 23 Main Street, you would just type "23" in the Street Number field and "Main Street" in the Street Name field and then hit the Search button. Your results will show up on the right side of the screen. There are many more ways to use the large search box. If you don't see the large multi-field search box, it may have become accidentally hidden. To show it, click on the small arrow icon immediately below the "Help" tab. Search by Name: There are two ways to search by name. The easiest way is to use the smaller search box that is just below the My Directory tab. For example, if you search for "Johnson," you'll find every listing name (first, middle, or last) that contains "Johnson." The second way is much less helpful and not worth explaining. The only items others can see in your listing are name, address, phone, and email information, plus any photo you may add to the listing. You can choose to hide your listing information from others in the print Directory, the online Directory, or both. You will see options to do this as you review and edit your listing. Please consider keeping your listing visible so that the Directory is most helpful to your neighbors. Only ECA members in this immediate neighborhood can see the information in your listing and it can't be seen or found by anyone else, and it won't show up in a web search. The online Directory uses some terminology that can be confusing. Households are frequently referred to as "dwellings." It also uses "Dwelling ID" numbers, which are of no relevance to users. Access to the Directory will end if your ECA membership expires. Remember to renew each year when you receive a renewal notice. You will see your address information listed first, in the white box near the top, with a separate grey boxes with information about each household member listed in the directory below that. You can edit most of that information, including adding or subtracting household members.